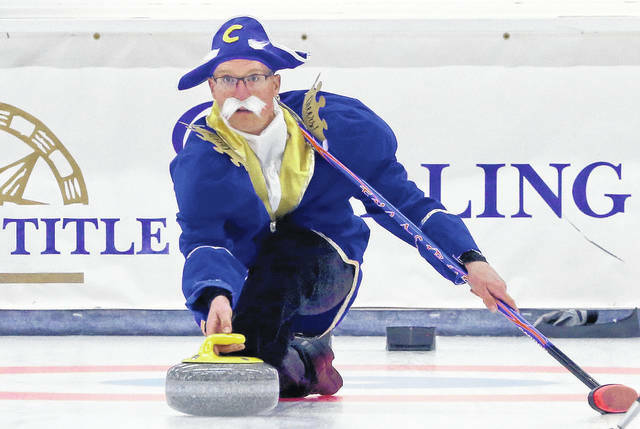 In this Thursday, April 4, 2019 photo, dressed as the cereal cartoon character Cap’n Crunch, Joe Welch throws a stone during the 84th Fairbanks International Bonspiel Thursday night, April 4, 2019 at the Fairbanks Curling Club in Fairbanks, Alaska. In this Saturday, April 6, 2019 photo, Maria Maxwell, left, and Kai Owens, right, sweep in front of a rock thrown by Jessika Dittler, back center, as the Owens Rink from Ohio compete during the 84th Fairbanks International Bonspiel Saturday afternoon, April 6, 2019 at the Fairbanks Curling Club in Fairbanks, Alaska. “This is a first-class club here,” Jessika Dittler, the team’s vice from Columbus, Ohio, said before they faced unbeaten Team Triple JK in a mixed division round-robin finale April 6. Team Winnie the Pooh was 2-3 in round robin play before it drew (threw) curling stones against 5-0 Team Triple JK. “It’s very exciting that they came this far to participate,” Team Triple JK skip Kelli Snider said. Team Winnie the Pooh’s other members are lead Maria Maxwell, from Columbus, and spouses Denise and Kai Owens, from Dublin, Ohio, a suburb of Columbus. Denise is the quartet’s skip and Kai plays at the second position. The Ohioans are newcomers to the Fairbanks International Bonspiel but not to the 49th State. The Owenses married in Alaska during the 1990s, when they were stationed at Anchorage’s Elmendorf Air Force Base (now Joint Base Elmendorf Richardson). Dittler is an Air Force “brat” and she graduated from Bartlett High School in Anchorage in 1976. “I live in Ohio but Alaska is my soul,” Dittler said. Maxwell’s son was stationed at Joint Base Elmendorf Richardson. “My connection to Alaska is I know these guys (Owenses),” she said with a laugh, “and my son was in the Army at JBER a couple of years ago. The foursome also loved that Alaska Airlines put a hub at Columbus International Airport and recently offered a special fare from there to Fairbanks. The quartet is members of the U.S. Curling Association, and members learned about the Fairbanks International Bonspiel through its magazine, Curling News. “Everybody here has been very welcoming and friendly,” Denise Owens said. 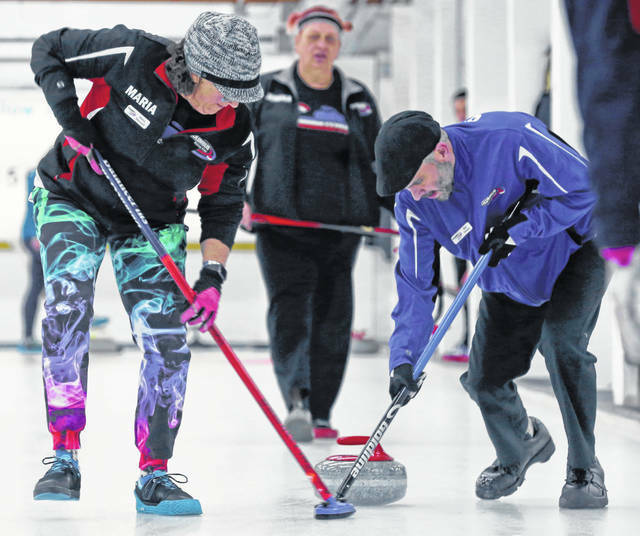 The curlers from the Buckeye State, according to Debbie Hall, Fairbanks Curling Club manager, were the first team to register for this year’s International Bonspiel. The Ohioans, however, weren’t aware of that distinction until Saturday night. “That’s cool,” Maxwell said with a smile. This year’s bonspiel has the theme Cartoon Craze, and several teams are competing in costumes of cartoon characters. The group from Ohio became characters from “Winnie the Pooh,” which was created by author AA Milne and made famous by Disney. Team Winnie the Pooh is collectively competitive but wins and losses seem irrelevant in its first competition in the Fairbanks Curling Club. The group combined has a few years of experience in the sport. Maxwell just started curling in October 2018 and the Fairbanks International Bonspiel is her first bonspiel. Dittler has 2 1/2 years of curling experience. “I always liked watching it on TV and then I learned there was a curling club three minutes from my house and it had been there eight years. I didn’t know that,” she said of the Columbus Curling Club, where the Owenses and Maxwell also practice and compete. Kai Owens indirectly discovered curling when he was first in Alaska. He and his wife starting curling three years ago in Columbus. When he was stationed at Elmendorf, he lived in the Government Hill area of Anchorage and he would drive by the Anchorage Curling Club on his way to work. “It was like ‘curling club? Did we even know what it was?’” Kai Owens recalled. “We didn’t realize what was going on until we saw the (Winter) Olympics. Denise Owens’ first exposure to curling was through a mechanical misfortune during the ’90s. Owens had received a transfer to another Air Force base and she drove with her then-young daughter from Alaska through Canada on the way to her new assignment. The family’s car at the time didn’t have a block heater and its engine froze near Beaver Creek, Yukon. The curling club had windows. “My 2-year-old daughter and I sat and watched curling for three hours while they used blast heaters to thaw our car,” Denise Owens said. A frozen engine led to her passion for a sport played on frozen water.